Outlier Cartel started a few years ago at flat warming party in Auckland in 2010. Carlos and his flatmates had invited everyone in the building to come and join their friends. However, only a couple of the neighbours showed up, Mark and Barbara from down the hall. Although they didn’t know it at the time, the seeds of good beer company were planted. Mark and Carlos, both ‘Outliers’ in spirit, thought there was much missing from the established New Zealand beer industry. After a few years of experimenting and planning, Carlos and Mark took the plunge and created Outlier Cartel. The idea was to create interesting beers that would challenge the idea of what good beers could be. More importantly, it simply had to taste good. 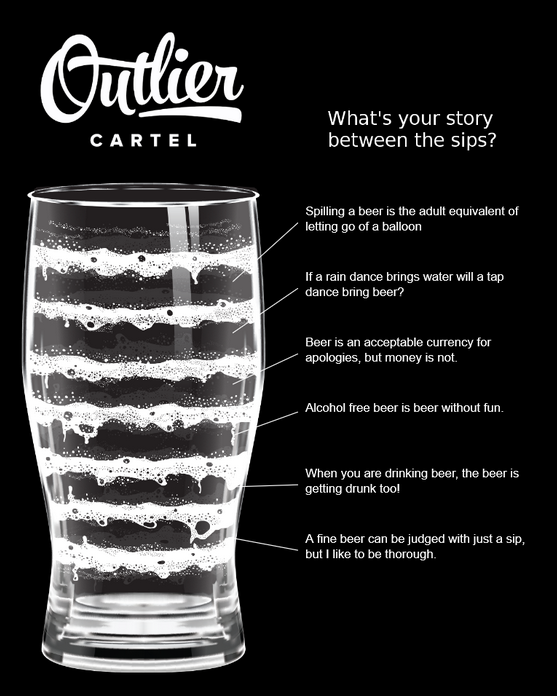 Though there were some trials along the way, on the 4th of December, 2015 Outlier Cartel officially launched, welcoming all on the fringe to enjoy great beverages! In early 2016, we welcomed the addition of the 3rd Cartelian in Alvin Soh. Alvin is a foodie, devoted husband and proud father of two three. Alvin is our Director and Chief Financial Officer – or as we like to call him, our ‘Supreme Chancellor of Numeric Confidence‘. He has been vital for our business planning and growth. So what’s in the name? We’ve gotten quite a few comments about our name. The name came about from Malcolm Gladwell’s Outliers, a book that we strongly identified with. The book demonstrates success as not based on what people are like, but where people are from such as the cultures that influenced them, upbringing, and family. Both of us were fortunate enough to migrate to New Zealand quite a few years ago, fusing our own experiences with a kiwi can-do attitude. 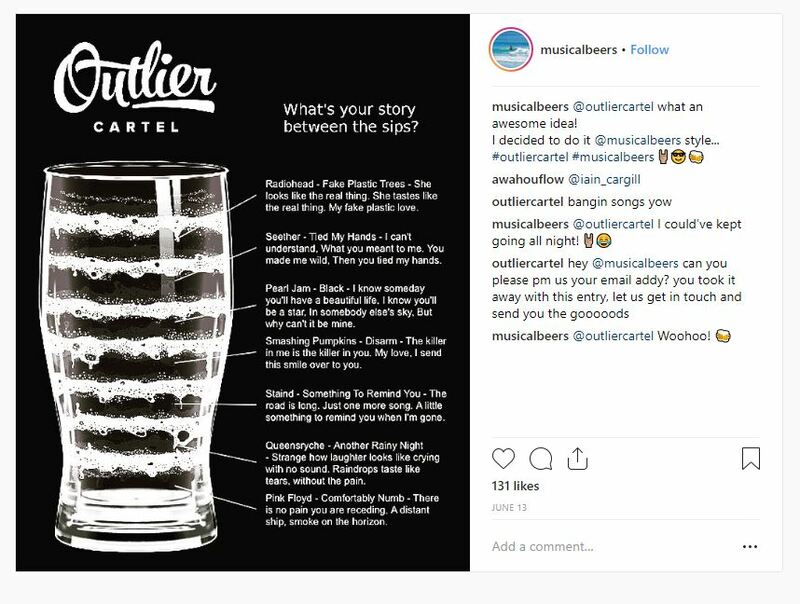 Cartel was decided because of the desire to go beyond just ‘beer’ – we love food and drink, so we wanted to think beyond just ‘beer’ or ‘brewery’. Cartel also represents a collaboration with like minded people, we don’t perceive other brewers as a threat; rather we see them as partners in our industry to bring the best products possible to consumers. So we welcome everyone to be part of the Outlier Cartel! Did you know that 14% percent of all the companies over a thousand years old have been breweries? If we extend that list to beverage makers (Sake, Wine, Tea and Distilleries), then that list extends to 35% of all thousand year companies. So even though we are small potatoes at the moment, we are in the right industry to be a Thousand Year business. So here is a hearty toast to you, your children and your ultra great grand children – may you all live a good life and drink well! At Outlier Cartel we are agnostic toward beer styles. We believe that every style, whether its popular or obscure has its own merits. We often blur the boundaries with our creations, sometimes making them very difficult to judge by ‘style’. For example, our Cargo Cult is a hybrid beer. Its a kölsch, but instead of using traditional ingredients for the style, we used rice, because we happen to like Japanese rice lagers. A kölsch itself is cross between an ale and lager! Yes, this may frustrate some drinkers who are keen to classify what they are drinking. We understand, after all its human nature to make sense of it all. For us, we are driven to create excellence in flavours rather to be true to style. We believe that beer is for everyone: from the seasoned sommelier to that person who just wants to unwind at the end of the day. This is why we say we are made for uncommon tastes; we know the range of palates varies significantly from person to person. So instead of being true to style, we ask ourselves an even more basic question: Does this taste good? 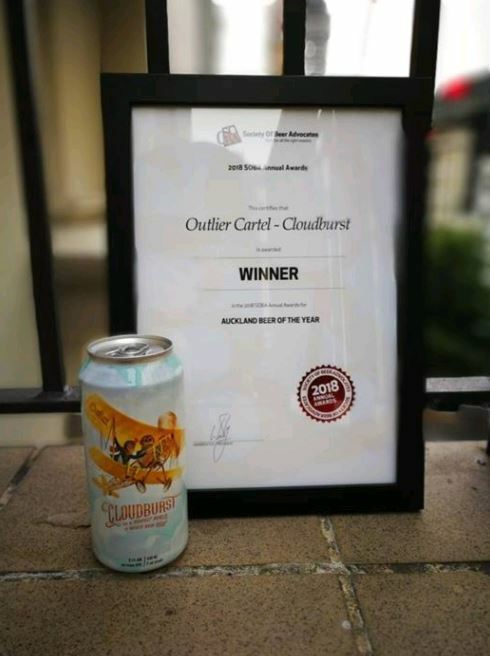 This is a short, but heart felt thank for all of you from SOBA who have voted our beer Cloudburst as Auckland’s Beer of the Year. Thank you so much, we were amazed by this result due to all the competition and excellent beers and breweries. You believed in us, and that is what keeps us ticking! Global trends show that alcohol consumption is declining. The youth of Britain, Australia, Iceland are drinking less, and even the stalwart drinking Russians are laying off the tipple. New Zealand is bucking this trend, both the younger demographic and older demographic are prone to hazardous drinking. Why is the global trend declining yet New Zealand falling behind? And what does this mean for your independent brewers? For individuals, alcohol binging to the point of becoming a danger to yourself or others is not respecting the drink. No one needs a sermon on blackouts, hangovers and walks of shame – most are familiar with the harsh byproducts of excessive consumption. For Alcohol producers, respecting the drink means making the highest quality product possible. Inversely, it means not mass producing alcohol and selling it cheaply. The Americans, say what you will about them, are again setting the example. In order to sustain the quality and become sustainable, US beer can charge more, and consumers are just fine with this. In contrast, their has been a dramatic increase in alcohol-free beer in the UK. This in part to both better health choices by millennials and a higher mark up for stronger beers. With a growth rate of 25% per year, Craft beer and microbreweries were blamed for a 15 million litre drop in alcohol sales overall in 2012, with Kiwis opting for higher-priced premium beers over cheaper brands. ‘Blame‘ is an interesting choice of words. Currently alcohol sales are booming in New Zealand, and it coinciding with the price drop in alcohol. Who or what is behind the price drop and what effect will it have on New Zealand? Children’s novelist Spencer Johnson is quoted for “Integrity is telling myself the truth. And honesty is telling the truth to other people.” Is the New Zealand Brewer’s Association being transparent with consumers? Truth in advertising. First of all, beer is not the beautiful truth. The Brewer’s Association promotion of beer as a health drink is wildly dishonest. Who’s your daddy? It is essential knowing where your beer comes from. White Labeling and its variants can be used deception marketing. This happens in two ways. The first way is by creating ‘premium’ looking brand and marking up a cheap product. Secondly, larger brewers can buy a local brewery, and use the former brewers reputation to sell flog massive amounts of beer. See our article on the illusion of choice. But then customers started complaining about pilling fabrics, bleeding dyes, and, most memorably, yoga pants so thin that they effectively became transparent when you bent over. Lululemon’s founder made things worse by suggesting that some women were too fat to wear the company’s clothes. Foundations built on dishonesty, lies and deception are a poor legacy to leave behind. Let’s face it – we love to drink! Sharing a drink celebrates passages in our life, and that is something ever brewer should endeavor to remember. We want our drinks to be part of those memories – whether its a wedding, a new job, your first child (or 3rd!). As craft brewers, its pure joy to create a product that can augment memorable moments in life. We respect those who drink less or decide not drink at all. Regardless of your choice, it becomes our privilege to share our drinks with you. Let’s face it, the best ideas had are usually in the shower or after a sip. Unfortunately, showers aren’t terrible portable – and people aren’t always comfortable sharing ideas in the shower. That’s why beer is hands down the best idea generator! When we first started planning what Outlier Cartel would be, we went down to our favourite Japanese joint in downtown Auckland, Genta. The first thing we would order was a tall, chilled mug of Orion beer. As we talked about our aspirations we noticed that inspiration would always come immediately after a sip of beer. And like a grand tree tells its life story through its rings, so did our tall mugs with its concentric lacing. After every sip, a new story formed, and it was told right there in our glasses!